One of the cutest things about babies is their rosy red cheeks. However, did you know that it could be a sign of Slapped Cheek Syndrome? If you’ve never heard of it, don’t worry – you’re not alone! The majority of new parents have no idea what Slapped Cheek Syndrome is or that it even existed. If your baby’s cheeks have suddenly become redder than usual, it could be an indicator of the condition. So what is Slapped Cheek Syndrome and is it something you need to worry about? Here you’ll discover everything you need to know. Otherwise referred to as Erythema Infectiosum, or Fifth Disease, Slapped Cheek Syndrome is an airborne virus. It causes a noticeable red rash on the cheeks and is spread via coughing and sneezing. The virus responsible for the condition is known as parvovirus B19 and it’s very common in children, though it can occur at any age. The good news is, in most cases, it is a mild infection that is fairly easy to treat. So, while it may look pretty nasty, it isn’t usually something you need to worry about. It is worth visiting a doctor to have the condition diagnosed, but it typically tends to clear up by itself over the course of one to three weeks. Another piece of good news – once you’ve had the virus once, your body is usually immune for the rest of your life. So, if your baby does develop it, they are highly unlikely to ever have it again. While the condition is characterised by a bright red rash on the cheeks, there are some other symptoms to look out for. The bad news is, symptoms only present themselves after your little one has become infected so there’s no real way of preventing it. You can expect to see symptoms from 4-14 days after the infection has taken hold, though in some cases they don’t occur for 21 days afterwards. 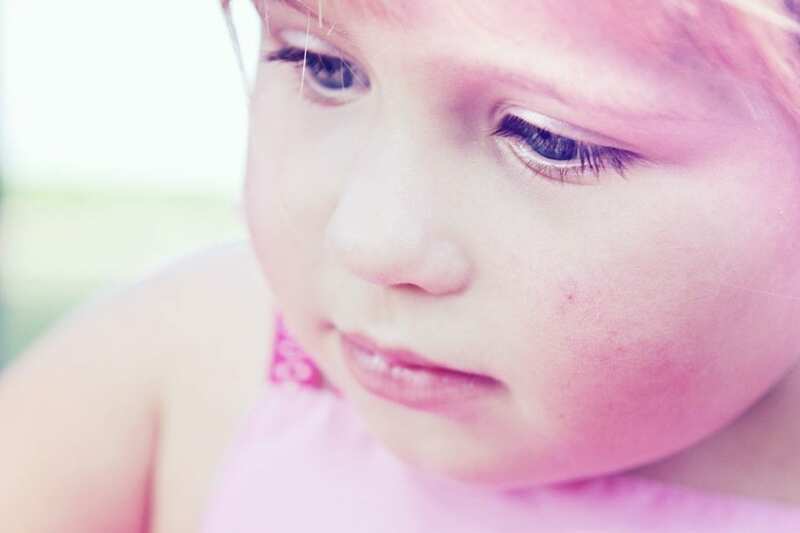 Of course, your little one can’t tell you how they are feeling so you’ll largely notice that they are a little more agitated and upset than usual. You may find it harder to soothe them and they may not want to feed as often as usual. However, you need to be aware that some babies don’t develop any of these symptoms. In fact, besides the rash on their cheeks they may feel absolutely fine. The rash is actually one of the last symptoms to show up. It also occurs in three different stages. The first stage is when the bright red rash will appear over the cheeks. It will fade a little in two-four days. Within four days later, the second stage will begin where the rash appears more of a light pink. It will be slightly raised and it does tend to turn itchy at this point. It can also spread to other parts of the body. Finally, the third stage is where the rash disappears, only to reappear over the course of two to three weeks. It’s worth noting, not all babies will develop the third stage, in many cases the rash will disappear for good after the second stage comes to an end. As mentioned earlier, it is worth consulting a doctor, even though the virus does tend to clear up by itself. As many of the symptoms, besides the cheek rash, are common with other illnesses, it’s worth seeking a proper diagnosis so you can be sure you’re dealing with Slapped Cheek Syndrome. Important note – While Slapped Cheek Syndrome is rarely dangerous, it can cause serious problems if your baby suffers with Thalassaemia or Sickle Cell Disease. This is because they have lower levels of red blood cells causing anaemia and Slapped Cheek Syndrome can actually worsen the condition. Is Slapped Cheek Syndrome Contagious? 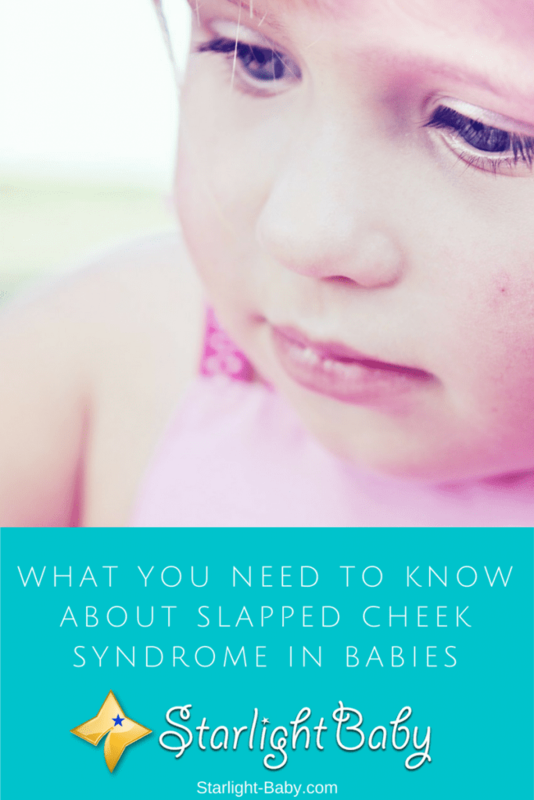 Slapped Cheek Syndrome is contagious, so it is possible you could catch it from your baby. However, as mentioned earlier, the body is immune once it has been exposed to the virus once. So, if you’ve already had it at some point, you won’t catch it again. You’ll know if you’ve caught it because you’ll typically experience joint pain and stiffness. It particularly affects the feet, hands, ankles and knees. These symptoms can recur several months afterwards. You could also develop the same rash and flu symptoms, but in some cases no symptoms are present at all so it’s possible you could have it and not even realise. Is Slapped Cheek Syndrome Treatable? So the condition is known to largely clear up by itself, but is there anything you can do to ease the symptoms until that happens? Ensuring your little one gets plenty of rest is the first thing you can do. This gives their tiny bodies a chance to recover faster. It’s also a good idea to encourage them to feed a little more frequently. This can really help bring down their fever and ensure they stay well hydrated. Infant tylenol can also be good to treat a fever, but you should seek advice from your doctor before trying this. They will be able to advise you on the right dosage to give your little one. Unfortunately, Slapped Cheek Syndrome is incredibly difficult to prevent. That’s because the infection is at its most contagious before you realise you even have it. Long before the symptoms really start, it is already being passed on. The only way you might be able to stop it is by ensuring everyone within the house washes their hands often. However, this is unlikely to make much of a difference to your infant’s chances of catching it. Overall, Slapped Cheek Syndrome can look pretty terrifying, but it’s actually really harmless. At worst, your baby will feel some discomfort, but as shown earlier, the symptoms can be managed. Have you ever had a baby with Slapped Cheek Syndrome? How did you work through it? If you have a story to tell, we’d love to hear it via the comment form below! Slapped Cheek Syndrome? I have never heard of it. I have a 10 months old child and I have never seen the symptoms mentioned above, therefore, I believe my baby has not been affected by parvovirus B19 virus. Well, my baby sometimes develops running nose, upset stomach etc, however, these conditions are not related to Slapped Cheek Syndrome. Thanks for sharing this useful and informative article.